This is a very powerful statue of a military leader clearly suggesting the thoughtfulness of a miliatary leader. Alpheus Williams was born in Connecticut in 1810, but was orphaned at age 19. Fortunately his family left him a bequest of $75,000. He used those funds to earn a degree from Yale in 1831, to study law and then furthered his education in Europe for almost two year studying military history, with an emphasis upon French military strategy. He returned to the United States and selected Detroit as his residence in 1836 for reasons that are not known. In 1837, he was admitted to the bar just as Michigan became a state. He served as a probate judge in Wayne County from 1840 to 1844, published the Detroit Advertiser newspaper from 1843 to 1847, was postmaster of Detroit from 1849 through 1853 and also served as a bank president and a member of the Board of Education. He became active in the military. Fort Lernoult was located in downtown Detroit until Fort Wayne was built in 1848. Alpheus Williams was on active duty in 1838 and 1839 and then served in the war against Mexico in the late 1840s rising to the rank of Commissioned Lieutenant Colonel. Shortly after the South Carolina militia attacked Fort Sumter in spring 1861, Alpheus Williams was appointed a Brigadier General in the Union Army. He was called to service, leading Michigan troops with the Army of the Potomac in October 1861. Under Generals Banks and Hallack, the Army of the Potomac fared very poorly in its battles with Confederate troops in the summer of 1862. General Williams led troops into several major battles in which the Union Armies were routed. During the early years of the long Civil War, a desolate President Lincoln probably spent many depressed evening fearing that the Confederates would win, and slavery would spread across the nation. Although he had assembled powerful armies, Lincoln's generals were reluctant to fight. This change with Lincoln's appointment of former Detroit resident Ulysses S. Grant. Many statues of generals on horseback show a triumphant leader. This is a most unusual depiction of General Williams. He is shown in rain gear studying a map on a dismal day, perhaps early in the Civil War when he was assigned to the impotent Army of the Potomac. Later in the war, his command was shifted to Tennessee and he led troops in General Sherman's highly successful marches through Georgia and the Carolinas, efforts that eventually assured the Union victory in April, 1865. General Williams continued his service for another year and half, commanding Union troops stationed in Arkansas. Following more than five years of active Army duty, he was appointed minister to San Salvador for the period from 1866 to 1869. He returned to Detroit and was an unsuccessful Democratic candidate for governor in 1870. He was elected to the 44th and 45th Congresses from Detroit and served from 1875 to December 21, 1878 when he died at the Capitol. The term Plug Ugly is linked to General Williams. This does not refer to him. Rather it was the name he gave to his horse during the Civil War. Augustus Saint-Gaudens popularized the idea of using a horse in sculptures of military heroes. Saint-Gaudeens statue of Civil War hero General Sherman in Central Park is one of this nation's best-known sculptures. Henry Merwin Shrady selected that style for this statue of General Williams but did not select a heroic pose. Note that the head of Plug Ugly is also lowered suggesting the horse is at ease, although this may have been done to focus the viewers' attention on General Williams himself. Since the peace at Appomattox, large numbers of Americans have studied the Civil War from almost every imaginary perspective. For a century or so, General Williams received little attention, even though he commanded troops in battles for more than three years. During that time, he wrote informative, crafted letters about his experiences to his family and friends in Detroit. Those important documents were little known, but in 1959, Wayne State University and the Detroit Historical Society published a compilation of his letters. After that, more attention was paid to the role he played in the military efforts to preserve the Union and end slavery. This statue was erected by the Military Order of the Loyal Legion of the United States, Michigan Commandery. This is one of the nation's oldest organizations of veterans and a group that continues to direct attention to the history of the Civil War. So far as I know, this is the only statue of a military hero erected in Michigan by that group. 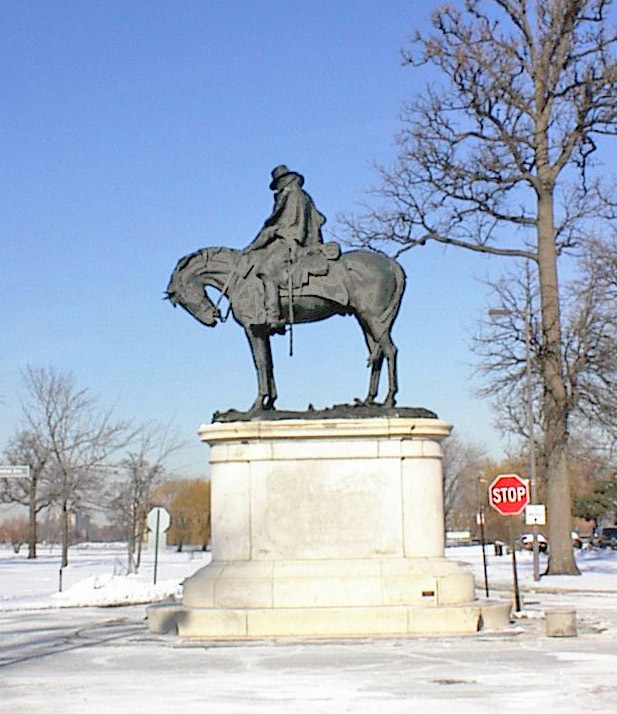 Materials: The base is granite while the horse and General Williams are in bronze.